By Edward Lundquist ay after day, the U.S. ships. Construction for two of the three coast at Alameda, Calif., and the fourth ages about $684 million per ship. Coast Guard continues to replacement programs are underway. and most recently commissioned, USC- The NSC is speci? cally designed to conduct its 11 statutory The 12 Hamilton-class 378-foot high en- GC Hamilton, commissioned in Decem- launch and recover both long range in- missions with its lim- durance cutters will be replaced by eight ber 2014 and now homeported at North terceptors and short range boats, heli- ited resources. It is chal- Bertholf-class 418-foot National Securi- Charleston, S.C. All eight of the NSCs copters and unmanned aerial vehicles D lenged to Invest in long-term operational ty Cutters (designated as WMSLs). The are being constructed in Pascagoula, at high sea states. The ship features an capacity while continuing to carry out its Coast Guard’s aging 110-foot Island- Miss., by the Ingalls Shipbuilding divi- aircraft hangar and stern ramp for launch daily missions. class and 87-foot patrol boats are being sion of Huntington Ingalls Industries. and recovery of boats. Navy Association symposium in Arling- Bear class for the lead ship of 13 ships) information, and advanced sensors and Close-in Weapon System (CIWS) for ton, Virginia. medium endurance cutters, which will combat management capabilities. point defense. 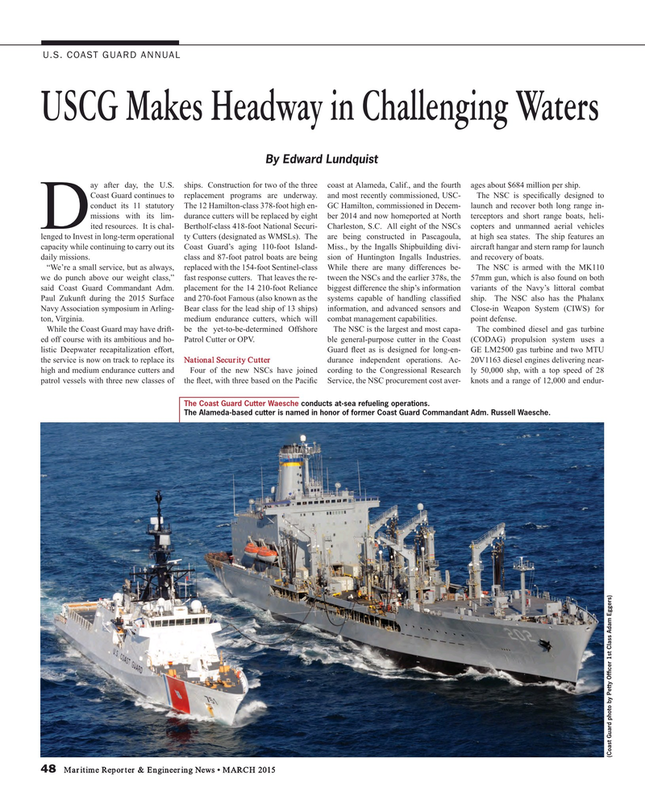 The Coast Guard Cutter Waesche conducts at-sea refueling operations.